Telluride's ART Walk, Thurs, April 4, 2019 5-8 p.m. join us at the Elinoff Gallery for a Chef demo. Culinary is Art => Chicken & Wild Mushroom Moneybags, Glazed Chicken Pinwheels with Telluride's Own Rub & Multi Purpose SW Seasoning from Kendra's Kitchen, A catered and festival favourite for many years. Chef will demo cool culinary gadgets to create ornate veggies for crudite, soups, salads and dinner plates. Montrose Wine & Food Festival, Fri, Sat., May 17 & 18, 2019 at the Bridges Golf Club in Montrose. For tickets and info please visit www.montrosewinefestival.com. A Fundraiser for the Boy's & Girls Club. Chef Kendra offers a Cooking Class complete with a bottle of Kendra's Kitchen Rub & Multi Purpose SW Seasoning for each student. Quick & Easy, Healthy Gourmet, Holiday Party Planning and High Altitude Cooking Tips. 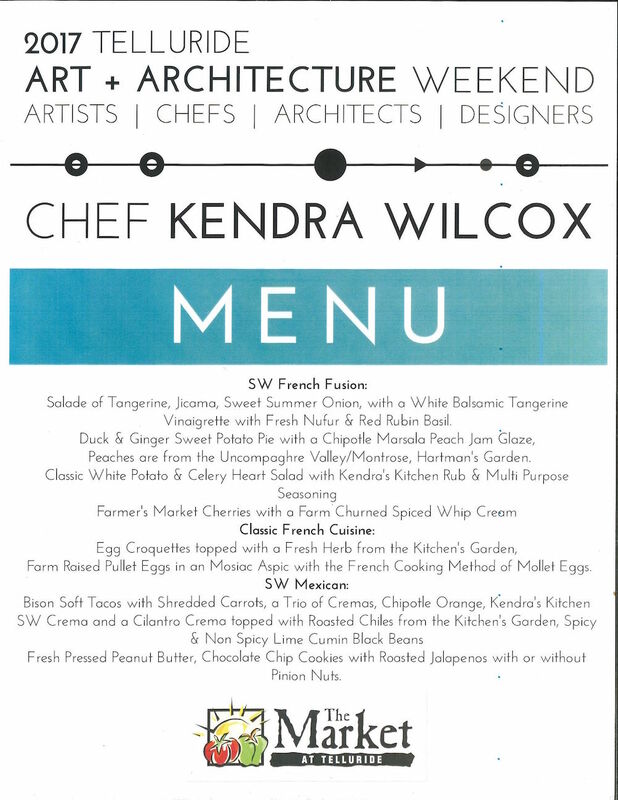 The Remington Restaurant at The Bridges Golf Club in Montrose has Kendra's Kitchen SW Seasoning paired with Locally produced products on their menu. Enjoy a delicious meal prepared by Chef Lacey Huntley and the most majestic view of the San Juan Mtns. Reservations recommended; 970.252.1119 www.montrosebridges.com , 2500 Bridges Drive. Tune into Telluride's KOTO Community Radio Friday, Feb. 22, 2019 2-3 p.m. for the Jimmy Jazz Fundraiser hosted by Hawkeye and Rube Felicelli. Chef Kendra will be offering a bottle of Telluride's Own Rub & SW Seasoning from KendrasKitchen.com and a cooking class with the various ways to use the multi purpose seasoning. Inventor Kendra A. Wilcox will be donating one/1 Patented opticwrap, a protective goggle covering that wraps around one's goggle secured with magnets and has a rubber strap that prevents it from sliding off your helmet, thus for a fog free ski or ride. Fits small, medium and large goggles. Protects from scratches and your investment. Join us for Mt. Village's Holiday Prelude and Santa's Village in the Conference Center, Sat. Dec 15 1-5 p.m. and Sunday 1-4 p.m. 2018. Telluride's Own Rub & Sw Seasoning from Kendra's Kitchen available for Purchase and order your Holiday Crudite Tree. Join Chef Kendra at 11th Annual Chile Bowl Fundrasier for Partners of Delta, Ouray & Montrose, Sat. Nov. 24th 2018 hosted by Lark & Sparrow in the Upstairs Grand Ballroom, 511 East Main Street, Montrose, CO 81401, 11:00 a.m. - 2:00 p.m. Anasazi Bean & Pumpkin Chile=> Vegi or Colorado Pork Sausage topped with an Orange Chipotle & Kendra's Kitchen Crema & Toasted Spiced Pumpkin or Pinion Nuts. Join the Best Chefs of Aspen's Roaring Fork Valley for a Chile Cook Off hosted by Integra Motorsports on Sat. Nov. 17, 2018 10:00 -3:00 p.m at their Glenwood Springs Store, 2302 Deverex Road, Chef www.AlexForsythe.com will be presenting his Chile Creation and topping it with Kendra's Kitchen SW Dip/Sauce/Base to Salads made with the Touted Telluride Own Rub & Multi Purpose Seasoning, as featured at the Aspen Food & Wine Classic and aired on the Food Network Channel / BBQ with Bobby Flay. Ms. Kendra A. Wilcox offers a Chef Demo for the 40th Anniversary for Montrose Farmer's Market & the Valley Food Partnership, Saturday Oct. 20, 2018, 10:00 - 2:00 p.m.
Velvety Soft Scrambled Eggs, Bratwurst Sausage in Cornbread loaf topped with a Buttermilk Sage Dressing and Baked Honey Cinnamon Apples. All Sourced from Local Farmers, Ranchers and Growers. 40 Year Anniversary! Since 1987, Chef has served as Elk camp cook at the Aldasoros Ranch, was personal Chef to Ralph & Ricky Lauren at their Double RL Ranch. 4 1/2 years later, www.KendrasKitchen.com had a catering and currently provides Chef services to exclusive accounts and For Fundraising. For more please check out this website & www.rockymtnrentalretreats.com 800.894.9086 & 970.708.7759. Please join us for a Demo by Chef Kendra at the Montrose Farmer's Market, Sat. Oct 27, 2018. 10:00 a.m. - 1 p.m. Celebrating the Fall Harvest, Whole Baked Pumpkin topped with a Spiced Cream Sauce and Caramelized Pumpkin Seeds. Toasted Pumpkin Seeds with Kendra's Kitchen Rub & Multi Purpose Seasoning, a great hiking fall foliage snack. 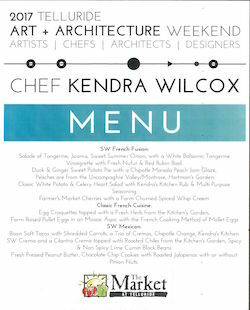 Please visit us for Kendra's Chef Demo, Culinary is ART at the Science of Cocktails, a Fundraiser for the Telluride Art District, Art & Architecture Weekend, Sat. July 21, 2018, 6:00-8:00 p.m. at the Telluride Warehouse Station. 2017 Toast to Telluride Thanksgiving Turkey or a Christmas Capon Dinner as featured in www.hauterebel.com, an online Lifestyle Magazine, �click here for menu & wine pairing by Chef Kendra. Ridgway Farmer's Market Community Table Pot Luck Lunch, Sat. Aug. 26, 2017, 1:00 - 3:00�� p.m., Clinton Street. Please join Chef Kendra, Culinary is Art. Rocky Mountain Trout in a Fennel & Fish Fumet Aspic with Quail Eggs, Roasted Peppers from the Kitchen's Garden served in� Hunting Camp Pinion Nut Biscuits with a Lime & Green Peppercorn Aioli. Veggie Apple Aspic with Quail Eggs, Roasted Yellow & Red Peppers and� Basil from the Kitchen's Garden served on whole grain bread with a Mayor made with Kendra's Kitchen Rub & Multi Purpose Seasoning. Fresh Pressed Peanut Butter Cookies with Roasted Jalape�os, Pinion Nuts & Chocolate Chips. Festivities, Art Walk and Moon Walk to Follow. TOP CHEF Competition at the Peaks Hotel in Mt. Village, 6:00 p.m. August 11, 2017, $75.00 a ticket, sales begin Aug, 1, to purchase please go to www.onetoonetelluirde.org. Taste of Telluride, August 11, 2017, Proceeds benefit the One to One Mentoring Program. Join Chef Kendra with her Creative Cuisine of Southwest French & SW Mexican, Tickets available through Telluride Tourism Board & One to One Mentoring. Pullet Egg Croquettes with Telluride's Own Rub & SW Seasoning and Herbs de Provence & Lavender. Cowboy Sliders with Hunting Camp Coffee seeped Colorado Bacon glazed with Chipotle Maple Marsala & topped with Kendra's Kitchen Multi Purpose Rub & SW Seasoning & with Mollet Quail Eggs => a French Cooking Method. Yak Burgers with Heirloom Tomato Ketchup from the Kitchen's Garden in the Uncompaghre Valley, Montrose, CO.
Bison Tacos with a Trio of Cremas, Chipotle Orange, SW made with Kendra's Kitchen Seasoning and a Cilantro Cumin Crema. Sage Sausage Burgers with Green & Pink Peppercorns Bluecorn Pinion Nut Biscuits. Fresh Pressed Peanut Butter Cookies with Roasted Jalepenos & Pecans. Bon Apetit, Bien Provecho, Cheers & Salud. Salade of Tangerine, Jicama, Sweet Summer Onion, with a White Balsamic Tangerine Vinaigrette with Fresh Nufur & Red Rubin Basil. �Peaches are from the Uncompaghre Valley/Montrose, Hartman's Garden. �Farm Raised Pullet Eggs in an Mosiac Aspic with the French Cooking Method of Mollet Eggs. Fresh Pressed Peanut Butter, Chocolate Chip Cookies with Roasted Jalapenos with or without Pinion Nuts. 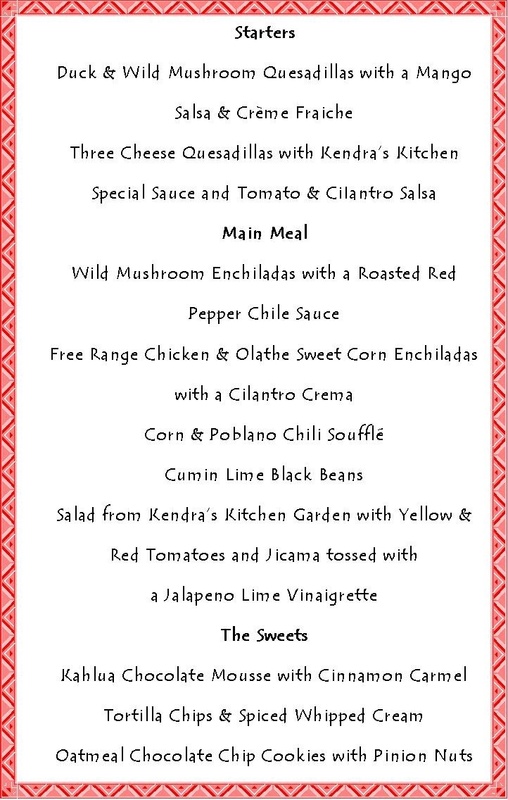 Join us for Chef Kendra's Creative SW Mexican Cuisine, 5-7:30 p.m. Click here for menu. Saturday Wine Maker's Duck Dinner is cancelled due to closure of the RED ROOM, 204 W. Colorado Ave. The Lorenz Building, below the Elinoff Gallery. Classic French and SW French Fusion Cuisine click here for menu (Word doc). Chef to Table, Farm to Table Community Table Dinners �- new location to be announced soon. ART WALK, Telluride, Colorado Ave, July 6, Thursday , 5-8 p.m.� Culinary is Art. CULINARY IS AN ART. a Chef masters flavors, textures, smell & shapes.� Please visit Chef Kendra at the headquarters of the www.telluridewinefestival.com , across from Telluride Truffles, for Noel Night, Wednesday, Dec. 7, 2016. 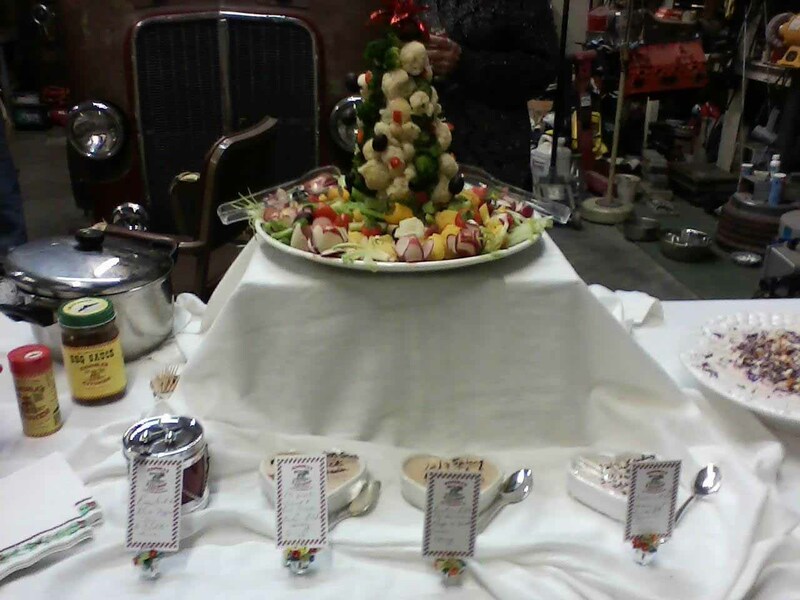 �She will exhibit a Crudite Christmas Tree paired with Kendra's Kitchen Multi Purpose SW Seasoning made into a Dip/Base to Salads/Special Sauce. Chef Kendra will be a participant at the 9th Annual Chile Bowl Fundraiser for Art Partners Mentoring Program,� Saturday, Nov. 26, 2016, 11-4 p.m., The Lark & Sparrow Venue, 511 E. Main St., Montrose, CO, 81401. This year she will donate a Vegi or Sausage Chile made from Uncompaghre Valley Colorado Proud Apples, Local Beans & Seeped Chiles from the Kitchen's Garden. The chile will be ornated with a Flower Shape made with Kendra's Kitchen Special SW Sauce/Dip and a Parsley Puree. Tickets are available through Partners Mentoring of Montrose, price includes a local artist's ceramic bowl. Celebrity Chef Kendra wil present a Chef Demo at Divine Fish & Meat Market, Thursday July 21, 2016 12:30 - 4:00/4:30 P.M. AT THEIR NEW LOCATION, By The Dollar Tree and new Rec Center in Montrose. Celebrity Chef Kendra will be presenting a demo for the Celebration of the Cherry Season, Rosemary, Kendra's Kitchen Chile Seasoning & Lemon Salsa. It is at Carniceria Sonora 347 N. 1 st street ( nr Cascade Bicycles) Montrose, on Sat, July 23, 2016, 11:30 - 3:30 p.m.�� They have a vast selection of Pinantas for a festive Sangria Party that are available for purchase. Ole! She will be selling her Seasoning - Cash only please. Carnerceria Sonora are selling boxes of ripe bing (plum coloured) cherries for $15.00 each. Happy Holidays. Thank you your business for the past 28 years! Chef Services/Cooking Classes available in Montrose, Mt. Village or Aspen. Prepay for Cuisine, Service & Gratuity due Day of the Meal. Fundraising: San Miguel Resource Center, Chocolate Lover's Fling. Chef Kendra offers a Cooking Class: Quick & Easy, Healthy Gourmet. Kendra is driving for Mt. Limo. Please Reserve with Mt. 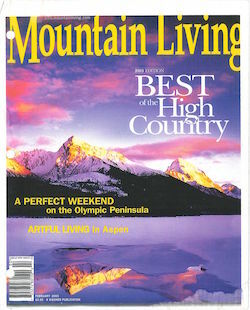 Limo Transportation Services 888.546.6894 or 970.728.9606 www.mountain-limo.com and Chef Kendra will share her recipes. Kendra will be at the Kitchen's Garden in Montrose for Spring Soil Prep/May Planting/Summer & Fall Crop. Delivered Meals from Harvested from the Garden or Shop at the Kitchen's Garden. Garden to Dinner Parties. 8th annual Chile Bowl Fundraiser for Partners, Mentoring Youth, Sat. Nov. 28th, 2015 at the new Lark & Sparrow Historic Venue in Montrose, CO.� 511 E. Main ST. Purchase a bottomless bowl of chile from 11:00 a.m-2 p.m.. �The bowl is your to keep! Chile donated by local restaurants and Chefs.� Vote for your Favorite.� Chef Kendra will be serving a chile made with Yak, Chiles & Tomatoes that are �grown at the Kitchen's Garden.� Garnished with combo of Colorado Proud Sour Cream & Kendra's Kitchen SW Seasoning, White Onions & Fresh Cilantro. 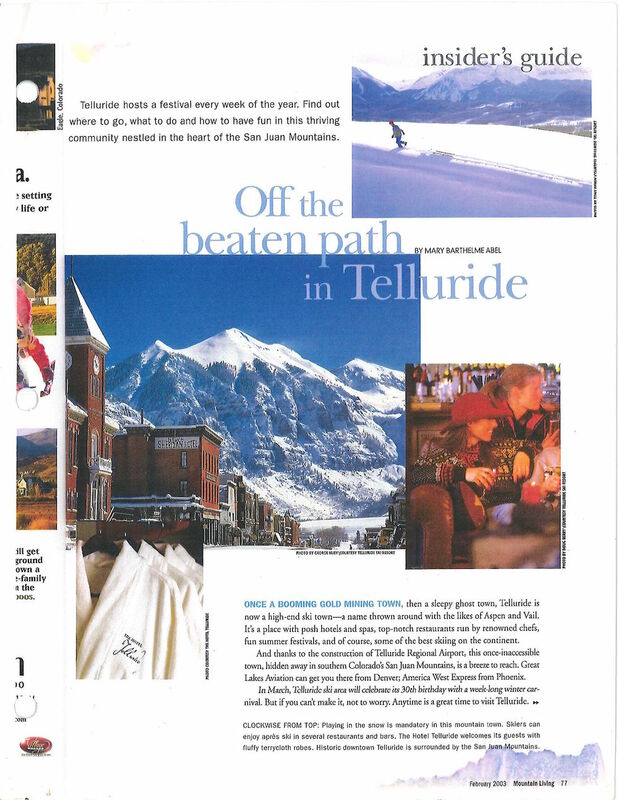 Dec. 2, 2015 - Noel Night in the Town of Telluride.� I'll be shopping at my favorite store Alpen Schatz which is centrally located downstairs on Main St. �Hope to see you there and Happy Holidays! November 14, Sat, 4 - 7p.m. 2015 Visit Chef Kendra for the Grand Opening Open House for Signature Events in Montrose, Colorado, Behind the Ford Nissan Dealership, 145 Merchant Drive. 1. Ms. Chef Kendra A. Wilcox is available for Chef Services for Winter Ski Season or Caribbean Sail Yachts �2015/2016 Season.� Prepay & Direct Pay Only.� Apres Ski or Sunset Happy Hour & Dinner Chef Only. ��Pease Ring for Pricing.� Gluten Free and Dietary Restrictions are an Extra Cost. 2. Visit Chef Kendra at Montrose, Colorado Farmer's Market Sat.Oct 31, 2015 8:30-1 p.m. for Fall Harvest of Heirloom Tomatoes = Nebraska Wedding, Great White, Pineapple, Cuero de Toro, , White Tomatoes, �Pianple Cuero de Toro, Yellow Boys, Sweet 100 Cherry, Red Pear, Rutgers, Super Fantastic, San Marzanos, Sweet Orange = Sun Gold, Mortgage Lifter, Red Robin and Beefsteak Tomatoes. �Candy Striped Chioggia, Detroit Dark & Albino Beets, Cosmic Purple Carrots, French Breakfast Radishes, White Globe Radishes, Okra, Regular & Round Zucchini, Yellow Round Squashes, Rainbow Swiss Chard, Beet Tops (healthier than Kale), Purple Kale, Tangy Sweet Parsnips, �Red & Purple Potatoes. ���Chile Garden of Pimiento, Peppercini, Hungarian Wax, Cayenne Long Slim, Anchos, Marconi, Carmen & Green Chiles. Shop at the Kitchen's Garden at the Ag House, www.rockymtnrentalretreats.com Mondays - Saturdays� 10:30 a.m. - 6 p.m.� October 31, 2015� 2:30 - 6 p.m. until Thanksgiving 2015. Frozen Salsas, Sauces, Filtered Water Stocks, Bases to Chiles & Soups, Ground Yak Meat, Yak Meatballs, Yak Chile & Quesadillas, Breakfast Burritos with a Trio of Salsas. Classic French Butter Birthday with a Chocolate Ganache flavored with Liqueurs of Chambord, Gran Marnier, Ginger Root, White Chocolate, Black Berry, Banana, Brandy & B�renj�ger� Honey Liqueur, paired with Ice Cream or Gelato Shaped in a Birthday Gift Box with Edible Chocolate Ribbons and a Singing Candles from Paris. All Foods Prepared with Love & Care by Chef Kendra A. Please ring half an hour prior to arrival or give her a 72 hour notice and she may assemble a Dinner for You & Your Family & Friends. Cottage Foods Industry of Colorado, Food Handling & Safety, Training on April 15, 2015 = Certificate Received and Posted at Farmer's Market. Chef Kendra Wilcox will be @ Farmer's Market in Mt. Village June 17 to Aug. 19, 2015, Wednesdays, Free Sunset Series Concerts to Follow. She will be selling, Cool Culinary Gadgets, Kendra's Kitchen� Rub & SW Seasoning, Fresh Herbs Planted and Cut to order, Menu Designing and Fresh Produce from the Kitchen's Garden at the AG house a www.rockymtnrentalretreats.com in Montrose, Colorado, USA. As of Jan. 3, 2015, Pre payment of Chef Services Only and in form of a Cashier's Check. Catering/ Farm to Table Cuisine exclusively prepared by Chef Kendra Wilcox. Visit us @ the 3rd Annual Western Colorado Food and Farm Forum, Jan. 9th 2015, 1-4 p.m. at the Montrose Fairgrounds and Jan 10th 9:00 a.m. - 5:00 p.m. @ The Montrose Pavillion. Topics: Bill McDorman, Executive Director & Co Founder of the Rocky Mountain Seed Alliance, "Seeding the Future of Food" and "Agritourism Made Possible", Liability & Insurance Concerns and the New Legistative Bill, 13-21--121, Colorado Revised Statuses. Panelists: Lee Bradley of Orchard Valley Farms & Black Ridge Winery, Kelli Hepler of Colorado AgTourism Association and Delta County Tourism and Rob Joseph from the City of Montrose Office of Business and the Montrose Assistant City Manager. If it is Not Safe, It is not Good. , Overviews of USDA Good Agricultural & Good Handling Practices & Tracy Vanderpool, Inspection Manager with the Department of Agriculture, talk "Farm Food Safety" and New Organic Sanitation Practices. "Lessons Learned" - Developing your business through effective Marketing and Ag Business Practices. 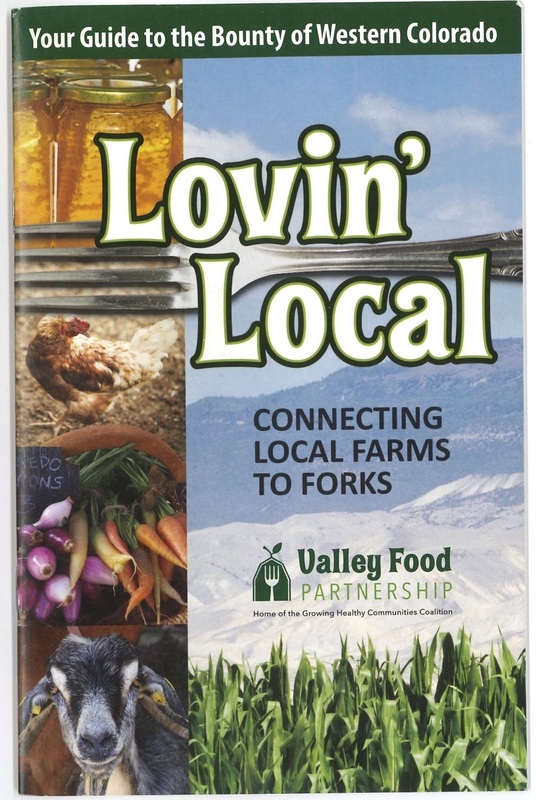 Hosted by Colorado State University Extension, Valley Food Partnership, Montrose Office of Business Tourism, Rocky Mountain Farmer's Union and Shavano. Cooking Class/Dinner Party Fundraiser purchased by Pat & Annabelle Bowlen, Owners of the Denver Broncos. Thanksgiving Menu 2014, Montrose, Ridgway or Mt. Village, Colorado, U.S.A. Chef Kendra will be available for Chef Services in Mt. Village, Aspen or WorldWide Travel, Caribbean. Pre paid with a Cashier's Check. Kendra’s Kitchen® Freshly Frozen Products, Rub & SW Seasoning and BBQ Sauce are available for purchase please call Chef Kendra, 970 708 7759, for delivery or pick up times. Location the Ag House/Kendraskitchen garden. 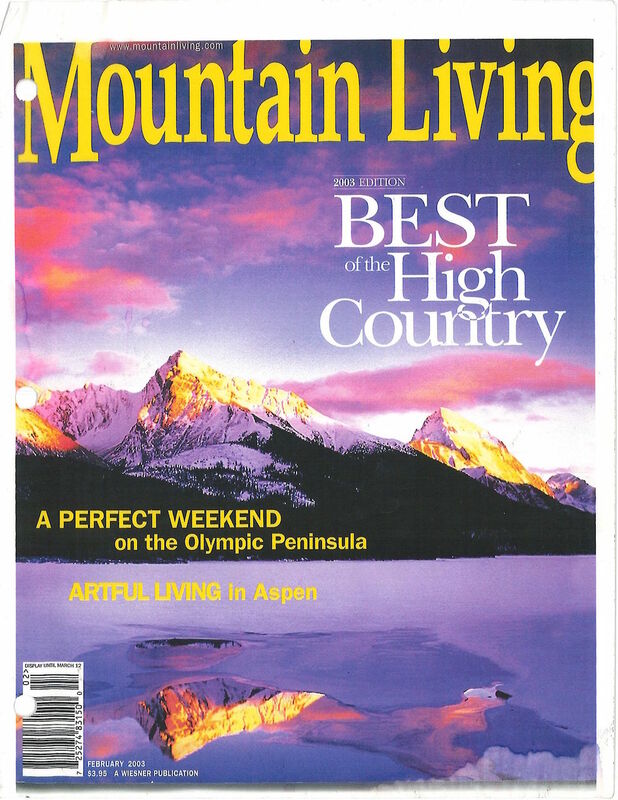 Delivery available in Mountain Village, Telluride or Aspen. Crispitas™ are back on the Market! Autumn 2014 Kendra’s Kitchen® Freshly Frozen Products, Quinoa Brunch Burritos with a trio of salsas, Potato and Bacon Breakfast Burritos and seasonal garden Chef Creation Dinner Burritos with sauces. Rub & SW Seasoning and BBQ Sauce are available for purchase. Please call Chef Kendra, 970 708 7759, for delivery or pick up times in Montrose at the Ag House/Kendra's Kitchen Garden. Delivery available in Mountain Village, Telluride or Aspen. Crispitas™ are back on the Market! Savor the San Juans, Montrose, CO, Sunday September 14, 2014, Estate/Home Dwellings paired with Chef Creations. Visit Chef Kendra for DelYaks of Montrose Meatballs with Kendra’s Kitchen® BBQ Sauce served in French Baquette Bowls baked by BIN - baked in Norwood . Complete the afternoon with wine tasting at Turn of the Century Banquet Hall. Yak in the Yurt. 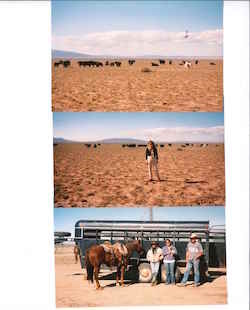 www.yakbreeder.com, yakmeat.us, call Bob for info on Yak products - 970 249 1734. Made possible by a grant given to the Montrose Office of Business and Tourism. Benefits 2 non profits, Montrose Community Foundation and the Valley Food Partnership, www.valleyfoodpartnership.org. Savor the San Juans is a home and chef showcase at seven properties in the Montrose area. Winner of the Pie Contest, Best of Show/Best Fall Festival,� Summer Squash (non GMO seeds) Custard Pie with Indian Ridge� Granola & Flax Seed Crumble and a Sourcream Sweet Sauce @ the 10th Annual Fall Festival in Meeker, NW CO. Sept. 28, 2013. �Sponsored by Mountain Valley Bank. Now Accepting Reservations for Chef Services for Thanksgiving and Winter Ski Season in SW Colorado. For New Menus �please click on sample menus. 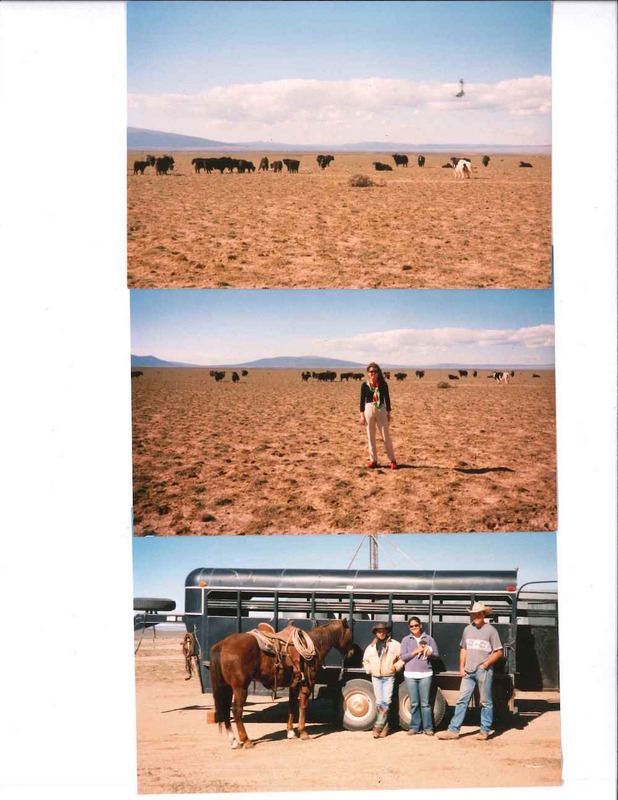 In addition to Chef services in SW Colorado, Chef Kendra is available for Catering, Weddings, Family Reunions, BBQ’s, Group Functions and Holiday Parties in NW Colorado, Meeker area, for Spring, Summer, Fall and early Winter Season 2013. The Ag House, Montrose, CO	is available for rent a perfect home away from home. Chef Kendra will be in Mt. Village/Telluride for the Holiday Season 2012. Advance Reservations are Greatly Appreciated! Kendra's Kitchen� Rub & SW Seasoning is Available @ The Market @ Mt. Village, Telluride, Colorado = Your local affordable grocery store in the Mt. Village. Visit us at The 2012 Telluride Festival of the Arts, Mt. Village , Telluride, Colorado. Aug. 17 - 19, Food & Wine Grand Tasting, Saturday Evening. Join us at THE Montrose Celebration of Art & Culture, Friday, Sept. 7, 2012, 5:30 - 8:30 p.m. at D/Medici's Footwear on Main. Visit The Kitchen's Garden at Farmer's Market in Meeker, NW Colorado, Hwy 13 at the Stage Stop Meat & Deli Shop, Every Wednesdays July 4th thru Harvest Season = Mid October 2012. Fresh Herbs by the Cut, Tomatoes & Chiles, Kendra's Kitchen Rub & SW Seasoning�, Laminated Recipe Cards and Cool Culinary Gadgets are available for purchase. Ask Kendra for her Chef Created Dinners that are simple, quick & nutritious and she customize a recipe for You & Your Family. She will supply you with the recipe, the fresh herb and Kendra's Kitchen Seasoning. Viola - Dinner is Done! Catering or Personal Chef Services are available in Meeker, Summer & Fall 2012. Join us at The Hunter's Outpost in Meeker, Co offering early a.m. Hot Breakfasts, Packed Lunches and Dinners. R.S.V.P Required. 800.894.9086 or KW@KendrasKitchen.com or dillond2003@yahoo.com Now Accepting Reservations for Hunting Season 2012. Winter Ski Season 2012/2013 Catering Offered and Dec. 17 thru Jan 4, 2013 Chef Kendra & Assistant are available for Personal Chef Services. As of Sept. 2011 Chef Kendra will be providing Personal Jet Chef Services for the Telluride Airport. Please telephone and email order. 800.894.9086 or 970.708.7759. ADVANCE RESERVATIONS PLEASE. DIRECT PAY ONLY. We Accept MC & Visa and will be accepting American Express in the near future. Celebrity Chef Kendra Wilcox- Dillon will be providing Brunch for AZADI Rugs, Colorado Ave/Central Main St. of Town of Telluride/ Next to the Nugget Theatre. Samples of her SW French Cuisine on Sunday Sept. 4, 2011. 11:00 a.m. to 1:30 p.m. Times to be determined re: the Telluride Film Festival which is published prior to the Film Festival. Click here for menu. Saturday, August 14, 2010, 5:30 - 8:00 p.m. in The Mt. Village. Chef Kendra will be sampling her BBQ Sauce and The Rub & SW Seasoning from Kendra's Kitchen and demonstrating the many ways to use the products. Complete with Kendra's Kitchen Seasoning as Featured on the Food Network Channel! Chef Demo at the Grand Junction's Farmer's Market, Thursday August 7, 5:30-8:30 p.m. & Fruta's Farmer's Market, Saturday, August 9, 8:30-Noon. 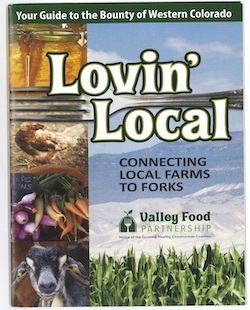 Join us @ the Aspen Farmer's Market , Conner Park, Saturday, July 12, 2008, 11:00 - 1:00 p.m. & @ the Crested Butte Farmer's Market, Sunday, July 13, 10:00 - 1:00 p.m. for a Chef's Demo and sampling of products. 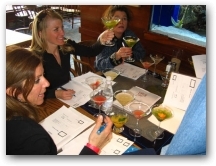 Chef Kendra is guest speaker at the Snowmass Wellness Experience 2008. Aspen/Snowmass, Colorado. August 15-17. Natural & Organic Foods; What is the difference? Subject matter will include farming methods for pest prevention, crop yield, price form farmer to consumer, food distribution and importance of buying locally, methods of preserving foods, manufactures & FDA food labelling guidelines. Chef demo of her quick & easy simple sauce which will include a fat free & dairy version, Sunday 1:30 - 3:00 p.m.
Back by popular demand! 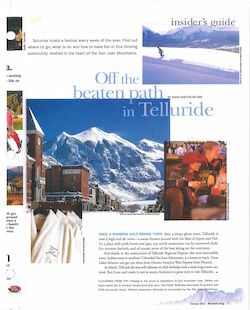 Chef Kendra will be a Guest Chef at the Telluride's Elks Lodge for the month of June. She will prepare Friday night dinners & Sunday brunches; Dinners: 6:30-8:30 p.m. & Brunches 10:00 a.m. - 1:00 p.m.. $17.00 for dinners and 15.00 for brunches, Kids $9.00/8.00. For menus please click here. Father's Day Brunch will include a door prize. Chef demo at the Montrose Farmer's Market, Saturday, June 7, 9:00 - 1:00 p.m. Cherry Jubilee, recipes will be handed out. Come sample Kendra's Kitchen products - a very low sodium Rub & SW Seasoning & the Healthy Gourmet BBQ Sauce - which actually taste good! Chef Kendra is Guest Chef at the Elks Lodge in Telluride for the month of May, Featuring Mother's Day and Father's Day Brunch, SW French Fusion Brunch, French Raclette & Belgian Chocolate Fondue, Mt. Film SW Mexican Dinner, Telluride's Own BBQ Dinner sampling Kendra's Rub & SW Seasoning and the Healthy gourmet BBQ Sauce. Kid friendly menu. Please join us for family community fun! Colorado Cuisine & Winemaker's & Chef Demo Dinners. Kevin Doyle, winemaker of Woody Creek Vineyards & Chef Kendra Wilcox offers Southwest French Fusion Dinners featuring award winning wines & food products. Available in Colorado. For Reservations please telephone 800.894.9086 or 970.923.2253. 2005 Cabernet Colorado Silver Medal winner 89 points with Wine Spectator. 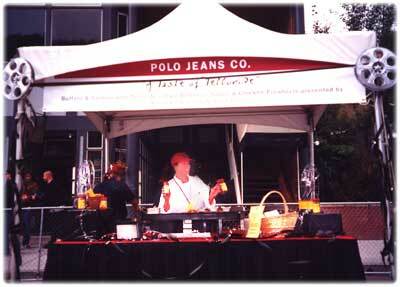 We will be providing personal Chef services, Weddings and Catering in Aspen & Telluride for the Summer & Fall 2008. I taught at the www.cookingschoolofaspen.com Southwest French Fusion Cuisine, SW Mexican (great with Kendra's Famous Margaritas) One Dish Meals, Easy Holiday Hors d'oeuvre Party, A Stress Free Sophisticated Dinner Party. Sweet Salades to serve after Dinner or how about a Chocolate Mousse with 90% of saturated fats & cholesterol removed - yet still tastes delicious! Hope to see you in one of my classes. Thank you for your support and orders for the past 20 years! Vegi Spinach Wraps with Kendra's Kitchen SW Dill Yogurt or Tofu "Mayo"
Organic Turkey Sausage Whole Wheat Wraps with Red Onions basted in Kendra's Kitchen Healthy Gourmet BBQ Sauce, a healthy gourmet hotdog! www.KendrasKitchen.com Health gourmet products were in the finalist category at the Healthy Gourmet Awards in London. Contact: USDA - agLondon marketing team. Food Network & Bobby Flay/BBQ filmed Chef Kendra preparing and serving a Southwest French Fusion BBQ for a private jet luncheon in the sky. Aspen Food & Wine Magazine Classic 2005. Sunday, September 5, 2004, 7:00 - 11:00 p.m. A Telluride Starry Night, Southwest French Fusion Cuisine - Hors d'oeuvres & a Classic Colorado BBQ, complemented by an Astronomy Program with Telescope by John Buting. The Conception, Design and Execution of the Event. Denver Merchandise Mart, Wednesday, Feb. 4, 2004, Noon, F- Hallway 4. Guest Speaker - Health Benefits of Eating Nutrionally, Chef Kendra's unique Southwest French Fusion Cuisine, Daily menu planning that is low in fat, low in cholesterol and low in sugar that leaves you with plenty of energy. - Denver, October & November 2003, Info Please Call 970.728.7222. Guest Chef at SOS Taste of The Nation 2003, July 20, 4-7 p.m. Guest Chef and Concessions at the 12th Annual Colorado Mountain Wine Fest, Sept. 20, 2003 10:30 a.m. - 5:30 p.m., Palisade, CO - Palisade Veterans Park. Contact Info 970.241.0596. SOS Operation Frontline - Kid's Cooking Class - Guest Celebrity Chef Kendra - April & May 2002. Info please call 303.892.8480. John F. Kennedy High School, Lakewood, CO, Oct. 17, 2001 and April 17, 2002, "The culinary profession and entrepreneurship" and A 2002 Nutrition Class - guidelines from the food pyramid from The USDA. 2002 Organic Fest and Wellness Expo, Saturday, April 20, 2002, 8:00 a.m. - 4:00 p.m., Central Park downtown Boulder, CO, Samples of products. Primal Quest & Telluride 360° Adventure Festival, July 11-14 200 : 4 -day festival, July 7-16, 2002: 10-day Adventure Race. Telluride, Mt. Village. CO Adventure Racing, World Cup Mountain Biking, Hiking, Bouldering/Climbing, Trail Running, Fly Fishing. Chef Kendra will provide a food booth with Chicken Breasts with The Rub & Southwest Seasoning and the BBQ Sauce from Kendra's Kitchen. Please have lunch with us! PBS Channel 6, April 20 -28, 2002, Celebrity Chef Kendra in an auction - Cooking Class Dinner Party in your home featuring Southwest French Fusion Cuisine. Info please contact Jack or Valerie - 303.592.6766. 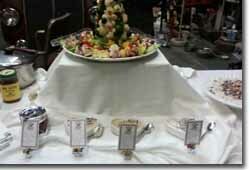 The WestEx Restaurant & Food Show 2002, January 29 & 30. The Denver Merchandise Mart, Guest Speaker, Packaging and Marketing a Natural Food Product Line with David Arvelo, FDA Guidelines and Food Labeling Wednesday January 30, 2002, 3:00 - 3:45 p.m. The Sunday Denver Post, Nov. 25, 2001, Front Page and Denver and the West Section. A Season to Share - Offering the Right Ingredients - Like many chefs Kendra Wilcox teaches cooking classes on the side. Wilcox is a volunteer from Share Our Strength's Operation Frontline, which teaches people in low-income households how to prepare nutritious meals through smart shopping and stove-top savvy. Story, 2B www.denverpost.com Archives. The Sunday Denver Post, March 31, 2002, Shining Stars - Post-News, A Season to Share, pages 1S - 6S. Chef Kendra volunteers for the SOS - Share our Strength Operation Frontline. Restaurateur of Colorado Dec 2001/Jan 2002 Celebrity Status - Chef Kendra Wilcox introduced to the Denver Culinary Scene by Nancy Clark. Info please call 303.263.1420. "This year present a party to die for with Kendra's elegantly delicious menu and time saving party planning tips." The Seasoned Chef Cooking School, Fall Holiday 2000, page 17. "Chef Profile - When the Rich and Famous ask you to cook for them you better be good. Telluride Chef Kendra Wilcox is Mangia, Colorado Expression, Holiday 2000. "Y2K is gone so why not party on - last year you ate Spam out of a can" Cocktail Party menu designed by Chef Kendra Wilcox - Colorado Springs Gazette, Dec. 27, 2000, Life - Food Section, by Teresa Farney, Food Editor. Kendra is a 'caterer to the stars' "all whom look to Kendra for healthy cuisine presented beautifully and prepared simply, but which lends its unique seasoning to Kendra's own style of seasoning." The Cooking School of Aspen, The Epicurean December 1999 - June 2000, Vol. 2 - No.3. WB2 Channel TV - Live - Easy Holiday Hors d' Oeuvre with Celebrity Chef Kendra - December 18, 2000, 8:50 a.m..
Colorado Expression - Mangia , Holiday Issue 2001, vol. 10, no. 5, Food Flash, Page 16, Photos of Chef Kendra hosting a party featuring Southwest French Fusion Cuisine. & Mangia, Fall 2003, The Colorado BBQ. Featuring Kendra's Kitchen Products. Chefs' Demos, Best of the West Food Fest, Montrose, Co., Sept. 15, 2002. Governor's Symposium - Celebrating Colorado Cuisine & Colorado Chefs, Keystone, CO Oct. 7 & 8, 2001. 970.728.7222 or 1.800.894.9086. Entrée's and Entertainment, Radio 1220 AM, Live with Eric King, Six Decades of Legendary Music, 10/13/01 & 11/6/02 & 4/15.03. The Simple Sauce from Kendra's Kitchen. "5 Ingredients, 4 Methods and 1 pan to clean!" The simple sauce: a protein, a cream, a fresh herb and the seasoning from Kendra's Kitchen. Vol. 12. Aug. 11, 2004. Taste of the Nation is the largest nationwide culinary benefit to fight hunger. Throughout the evening there will be live music, a silent auction, resplendent dining, and sampling of wines from around the world. Chef Kendra has written 2 cookbooks. A new cool product! www.opticwrap.com For kids and adults. [Governor's Sympsium - Celebrating Colorado Cuisine & Colorado Chefs.] Chef's Demo- Buffalo and Salmon with Telluride's Own BBQ Sauce® & Chicken Pinwheels with The Rub & Southwest Seasoning from Kendra's Kitchen. Sample of Southwest French Fusion Cuisine. The Denver Press Club and The Double RL Ranch/ Ralph & Ricky Lauren & Family for the SOS - Operation Frontline, The Court House Inc., The Denver Broncos Charities Fund, Inc., Big Brothers-Big Sisters of Colorado, Higher Grounds, San Miguel Resource Center, Climb For the Kids - The Children's Hospital, Mt. Evans Hospice, The Arthritis Foundation, Denver Art Musuem, The Joffery Ballet and Angel Baskets Holiday Season - 1987 - 2002. Kendra at "A Taste of Telluride." great for holiday gifts - nothing like it on the market! - Product Line: Telluride's Own Southwest Seasoning & Rub from Kendra's Kitchen Natural Foods, Telluride's Own BBQ Sauce. Ralph Lauren / Polo Corporation. 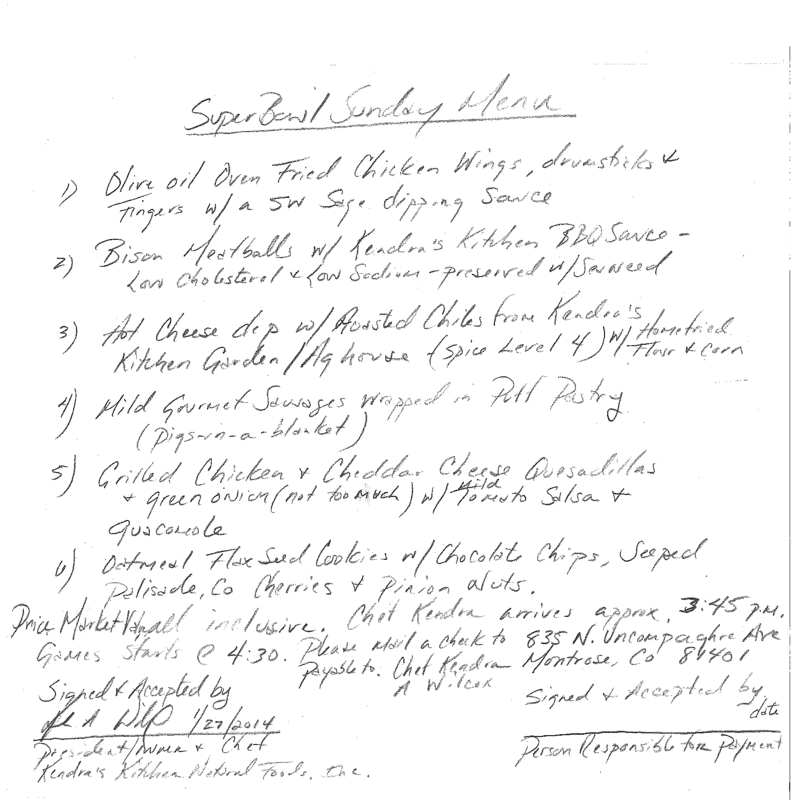 - Family Chef for: Mr. & Mrs. Genita Poole, Jr.
- Pell Grant - 1982 - 1986.